I can write those three words, post some pictures and leave you on your own. Everyone has dreams, built from bits and pieces of stories we heard about it, read in a glossy magazine or simply imagined in a romance induced coma. It is so iconic that none of my commentary is necessary to fill in the blanks, not a word, even if you have never stepped foot in India. I can, but I won’t (see, I know how to use apostrophes). The anticipation has been building for awhile. As soon as we said we are off to Agra, the city the Taj can be found in, my heart rate stayed just that little bit faster. 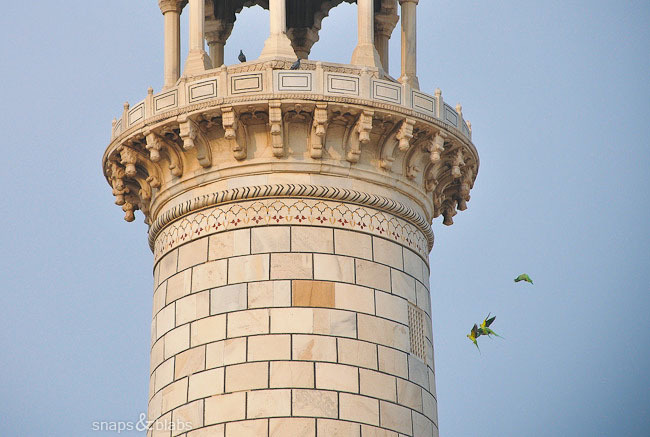 Agra is nothing without its Taj. 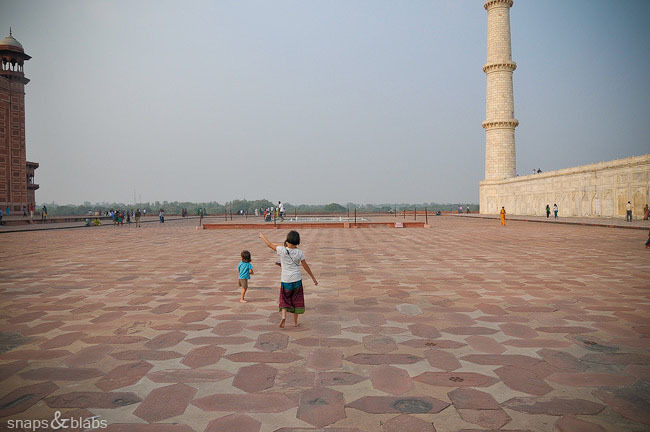 Other than a few buildings, nothing hints that this was once the capital of the powerful Mughal Empire. What is left is a small unassuming town, crumbling from within itself, grabbing as hard as it can to the white marbled lifeline that keeps it going. Still, the place is remarkably simple, especially compared to the monstrous development that is engulfing Siem Reap with an ugly enormous hotel, next to an ugly enormous hotel. Walk in most of the other parts of the town and other than the Taj laundries, Taj restaurants and Taj everythings, you wouldn’t know that such greatness is just a few blocks away. 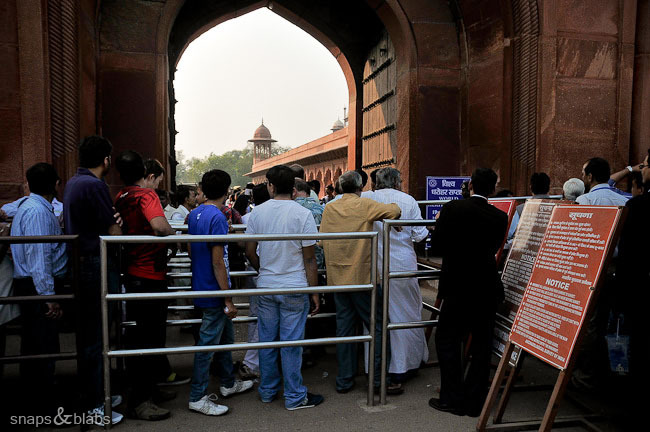 The Taj Mahal is surrounded by a red sandstone wall, which hides it from view until you get inside the enclosure. 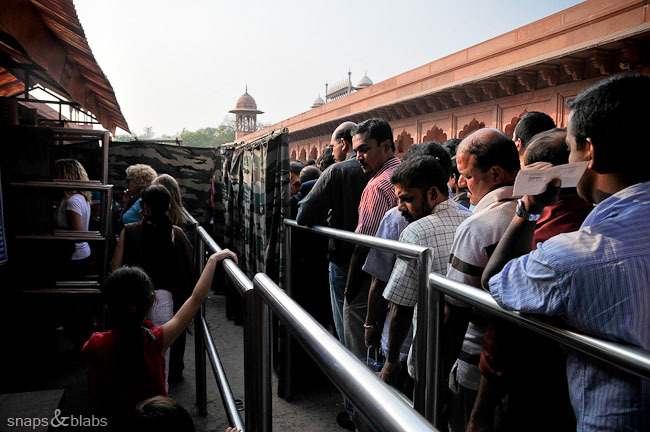 There are three gates which open up to the influx of visitors. We came from the East and waited in our respected lanes: Foreign Women and Foreign Men. We do pay more than ten times the going rate for locals, but thankfully we get some perks for it, like shorter queues. Once we entered we faced the Grand Gate and straight away it reminded me of Jama Masjid in Delhi, yet another masterpiece commissioned by Shah Jahan. He, ladies and gentlemen, is the man responsible for this grandeur. 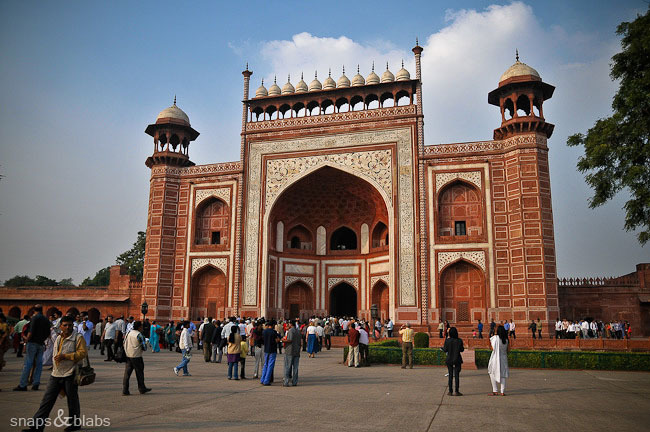 Shah Jahan achieved a lot more in his life than building the Taj Mahal. He reigned over what is now known as the Golden Age of the Mughal Empire. The throne was not given to him on a platter, he had to fight for it, as was the tradition in his family. So he successfully led his father’s armies around India and won the support of most of the royal court. Unfortunately Jahangir, his father, at the latter point in his life decided that spending time with opium and alcohol is quite enjoyable and left the serious work to his favorite wife – Nur Jahan. He had a few to choose from too, but she was not only beautiful, but strong and with a razor sharp mind. Power is hard to let go of and Nur Jahan had a plan to try and keep her hand in it for as long as possible: marry her daughter from her first marriage to Shah Jahan’s brother and then make him the emperor. This is how drama unfolds after the death of Jahangir in 1627. 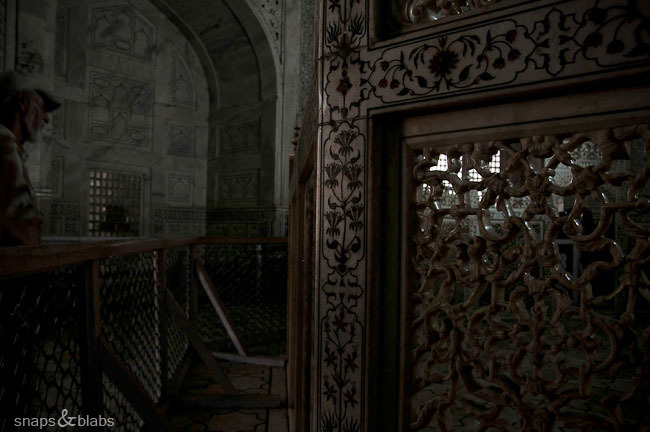 Shah Jahan’s step mom makes sure that his little brother, and her son in law Shahyar, takes over the empty throne and he immediately opens the treasury and starts to pay off the nobles to gain their support, because he did not actually have it. He is also forced to face off the army of Asaf Khan, one of Shah Jahan’s trusted men, and after being defeated, he is blinded as punishment by him. Until a few days later, when the man who will build the Taj Mahal is the new Mughal emperor, and to make sure nobody else challenges him again, kills off all of his male siblings. Of course. Asaf Khan, the man who helped secure the throne for Shah Jahan, was Nur Jahan‘s older brother. You really could not trust anyone, can you? 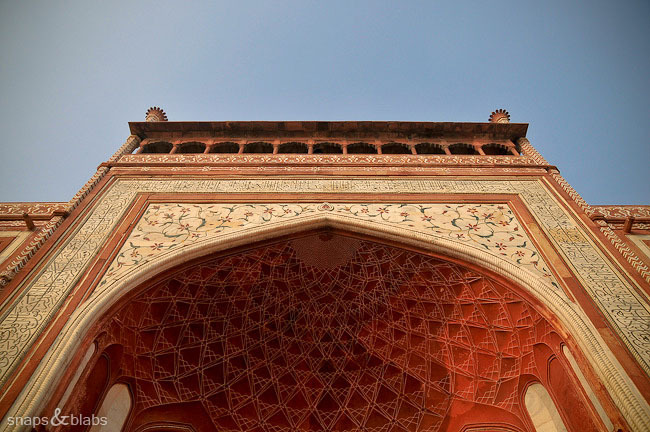 Looking up to the beautiful Great Gate above me though, I really did not care about the bloody soap opera that ensured Shah Jahan’s reign and gave him the ability to build some of the best examples of Islamic architecture around. The first frontal sighting of the Taj Mahal is through the comparatively small opening at the back of the iwan. The funnel was full of eager people slow stepping in the darkness with camera above them trying to snap the shot taken from millions of visitors before them. Asaf Khan, the man who betrayed his strong willed sister to be loyal to the Mughal emperors, and killed off all the male threats to the throne, including his nieces’ husband, had a daughter. A beautiful girl named Arjumand Banu Begum and she might offer some explanation for the actions of her father. 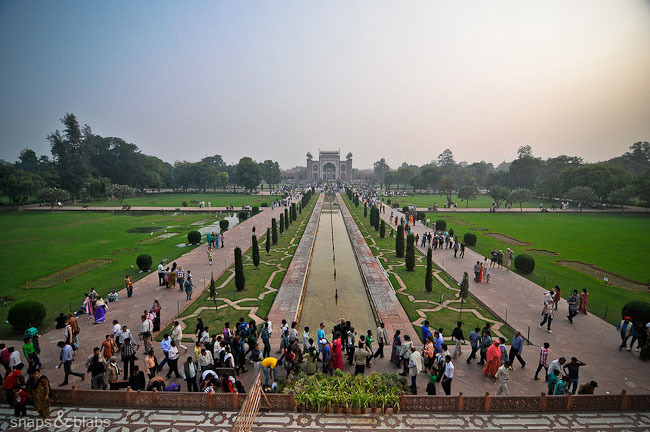 At the age of 14 she was engaged to Shah Jahan and five years later joined him as his third wife and became known as Mumtaz Mahal – The Best of the Palace. By all accounts she deserved the title, although to be fair, not many really knew, even the poets who sang her praises. The women of India at the time had to observe strict purdah – almost full separation from the world of men in the form of complete body covering and segregation in the home – and this applied even more for the women designated for the royal men. Guarded by eunuchs they spent their time in lavish prisons. Mumtaz was her husband’s favorite and followed him around on his frequent travels around India and had 14 children in the span of 18 years. You do the maths, because as a woman it simply hurts to even think about it. After the bloody succession drama, she got to be the Empress for only 4 years before dying during the birth of her last child. 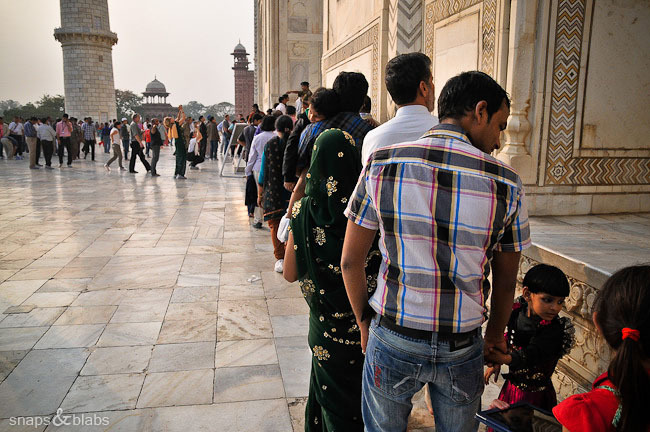 Shah Jahan was grief stricken. 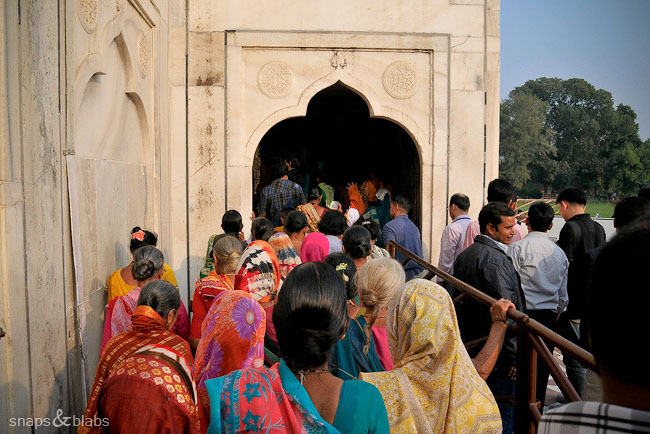 Walking towards the Taj Mahal, I could not doubt his love. The place was full of people, cameras flashing around and the atmosphere generally resembled a busy street in the frenzy of a surprise appearance of a celebrity. 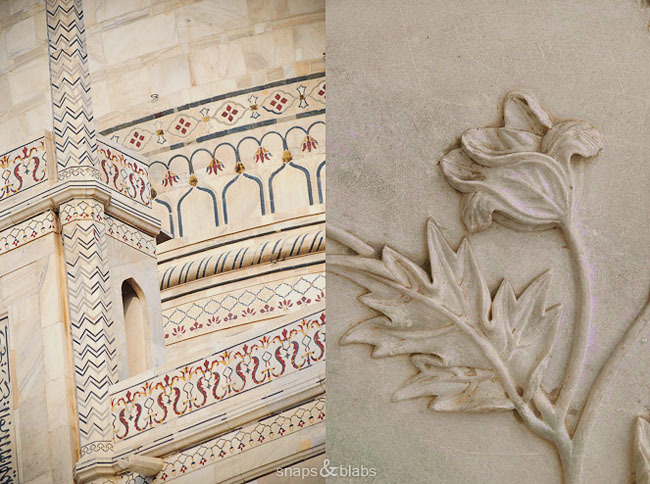 Still, the masterfully crafted marble ahead manages to stand its ground and our attention kept on resting on it. 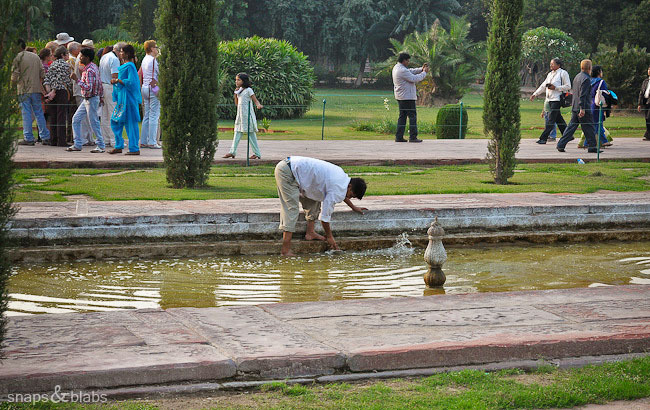 Even the sweaty men, scrubbing the not so blue waters of the non-working fountains could not distract us for long. Because in the end, the long story doesnt seem to matter. Who killed who, why, power struggles, Golden Ages, artistic vision and aesthetics… Once you stand close to this building, you do see love. This cannot be just a grave. 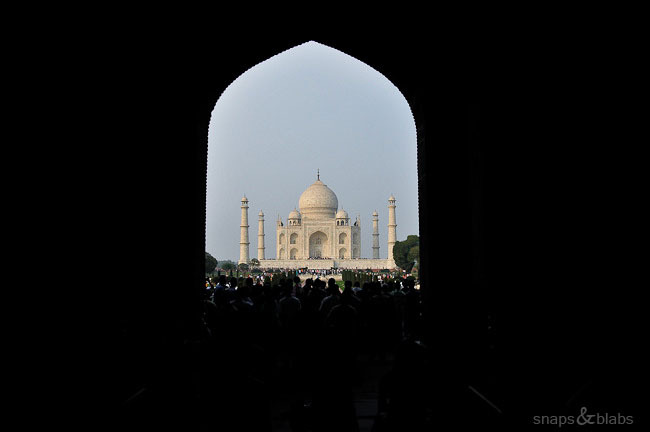 The Taj Mahal is big, the areas around it are vast and I could not help but being taken by it. The relief from the crowds was short lived, as we took our shoes off to make our way up the narrow stairs at the front of the platform on which the mausoleum stands on. Jiggly bellies of women swung all around me under saris of every color in the rainbow. Badges no doubt of a lot less children than our sister Mumtaz had to deliver. I see them all around India, saggy skin over the folds of fabric sparkling with stretch marks. Maybe the look is not as despised here as in my culture, after all the Emperor had a few more wives, a taste for beautiful concubines of which he had hundreds, and yet, Mumtaz got a whole lot of his attention. Saggy skin and all. Once on the platform it is a special treat to feel the marble under your bare feet. If you make it here, dont miss it by using those funny looking booties that frankly make you look ridiculous and end up littering the grounds. Eventually we took our place in the queue and awaited our turn to enter. 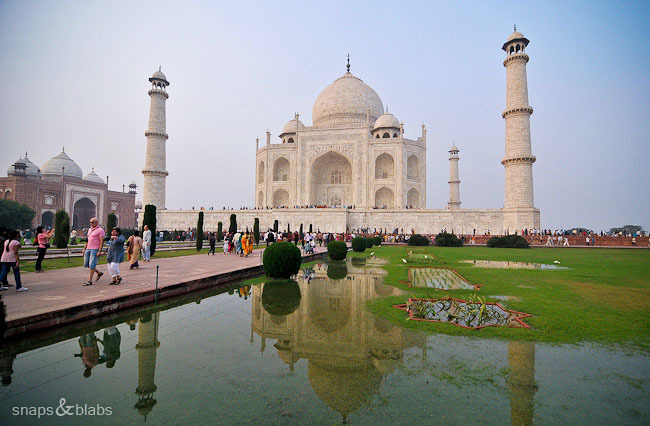 It took Shah Jahan 22 years to finish the Taj Mahal after the death of Mumtaz. Artists from all over the world contributed to the project. The Emperor was not an amateur, he had a keen interest in architecture from the time he was a youth and contributed many buildings as a legacy of his reign. Waiting in line and looking all around me, I found myself wanting. 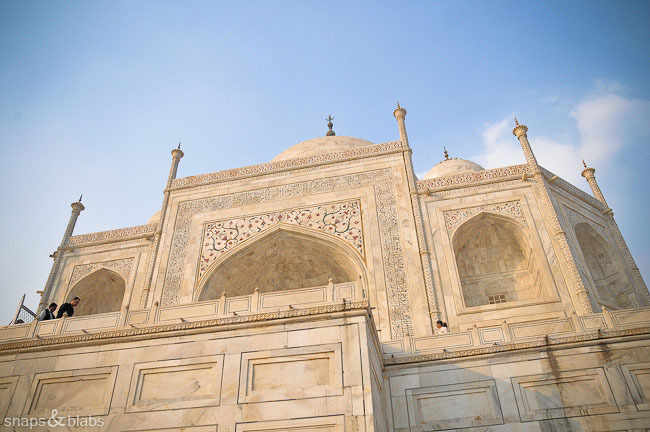 After months of traveling through Asia, visiting all kinds of places and temples, shrines and palaces, and especially the other examples of Islamic architecture in India, my expectations on the Taj were high, especially as far as intricacy was concerned. Everyone says this is what really makes impression on them on their visit here – the fine detail. And there I was, missing exactly that. Please, dont get the wrong impression. There is plenty of it all around. We entered and suddenly all that light turned into gloom. 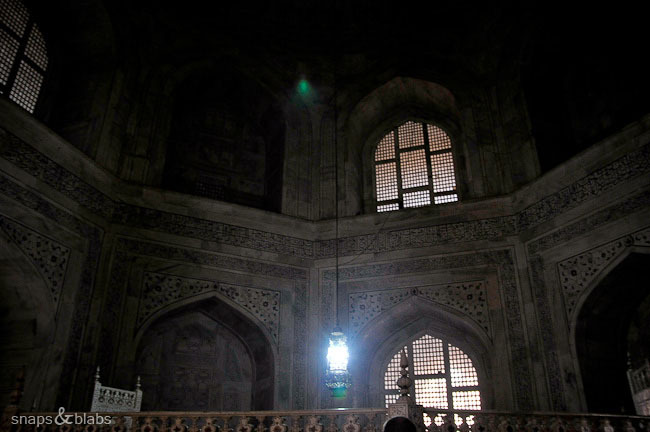 We followed the crowd around the darkness, ducked a few low doorways and found ourselves in the very middle of the Taj, where the lavishly decorated cenotaph of Mumtaz Mahal can be found. It is not the actual grave, that can be found at a lower level, where less decoration can satisfy the requirements of Islam. Up here, lit by the cold light swinging from the ceiling, I could see the Arabic calligraphy running up the walls, albeit barely. 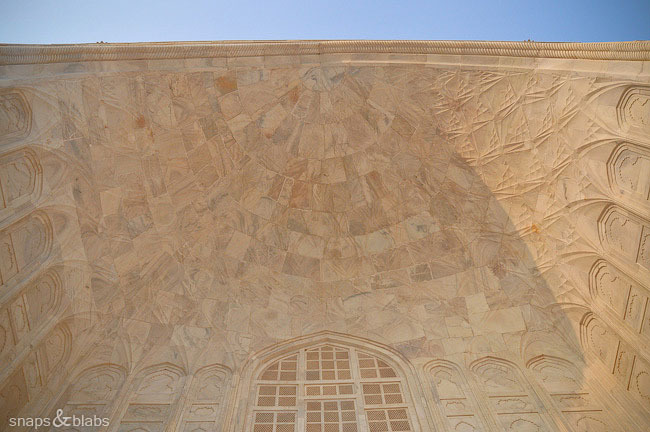 I could squint and marvel at the intricately carved marble jali (screen) that surrounds the center point. Amidst the flashing lights of the cameras taking “not allowed” pictures, I could almost make out the beautiful interior covering the walls that seem to go on forever in height. I could also sense the unmistakable stench of feet permeating deep through my nostrils, carried and fermented generously by the stagnant air around me. People were shoving me around from every direction and I was trying to make sure that no child was left behind all the while wishing that more people chose to wear those darn booties. What is some fashion faux pas in the face of destroying one of the world’s marvels? Its hard to find art that goes well with that which should be left contained in the privacy of a musky shoe. The Taj Mahal is not one of those in my humble and unprofessional opinion. I just wanted to leave, to see the light again and breathe the “freshness” of the Indian open air. As much as the outside of the Taj is sparkling and overwhelmingly grand, I found its belly to be depressingly exactly the opposite. Somehow the typically Indian modern mismanagement of the site has achieved a realist representation of the life of the Emperor that built it – opulent and refined with the dark story of a family having to be torn apart, gouged eyes and dead brothers and the constant threat of challengers for the throne. It could very well be how Mumtaz felt being dragged around the country, under her silk veils, stuffed in a palanquin and tucked in her elaborate jail, unable to take a breath between pregnancies sucking up the life out of her until she could handle no more. We will never know, because she is like a mirage that nobody that mattered saw, that never made any waves outside her designated segregation. 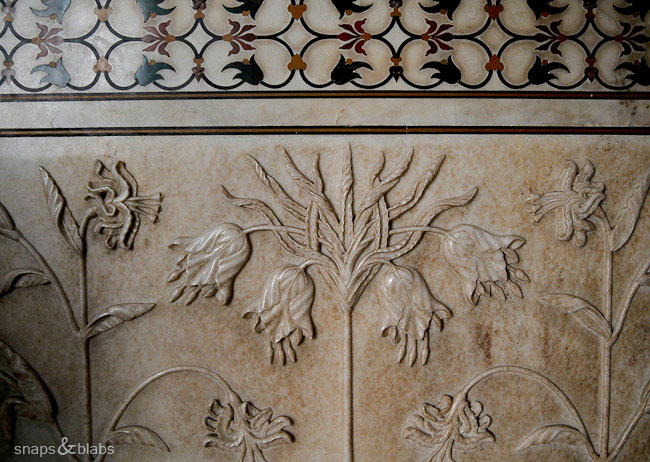 They say that it was love that urged Shah Jahan to build this tomb for her, but who really knows. The story we all know is beautiful and fits the building. 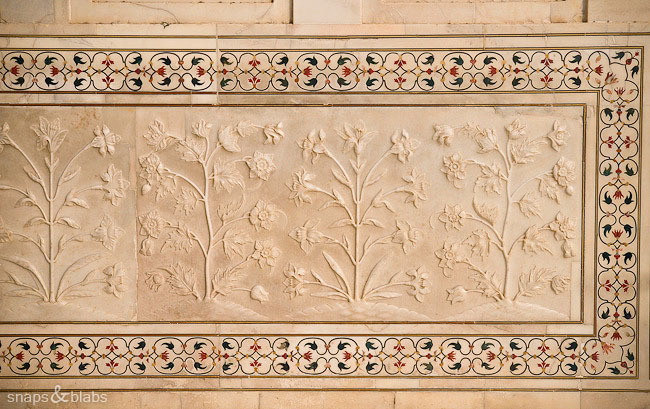 The only asymmetric feature in the Taj Mahal, the only thing that doesnt quite fit, is the sarcophagus of its creator.After a a successful and fruitful reign as an Emperor, Shah Jahan was imprisoned by his son in the fort he built in Agra. He spent his last years, locked up in his beautiful palace, with the company of numerous concubines just a short ride away down the river to his Taj Mahal, where his son will plonk him in after his death as the afterthought that he was there. And suddenly, Mumtaz is overshadowed in her own tomb, by a bigger, taller cenotaph. And somehow the full circle is completed – like father, like son; hierarchy and reality of who is who and who is more. Looking down to the Great Gate and the garden with ponds representing the four rivers of paradise filled with milk, honey, wine and water as described in the Qur’an, I hoped that Mumtaz found her rest in a place that is truly her own, is not managed by Indians who neglect to clean the fountains or let seepage create large puddles on the green lawns, where her husband is not bigger and more important than her and half of her children dont die. And it smells of flowers all around. I love it how you step-by-step described your discovery of the Taj Mahal. 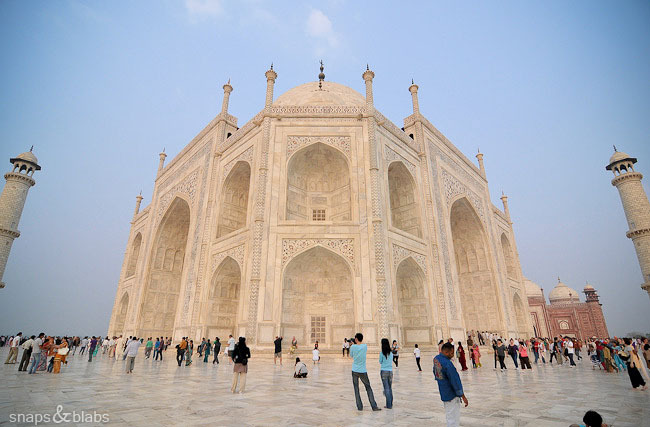 We visited the Taj back in 1998 and I very well remember the entrance and the outside views. I have to be honest that I don’t remember anything from the interior, maybe that confirms how you felt. 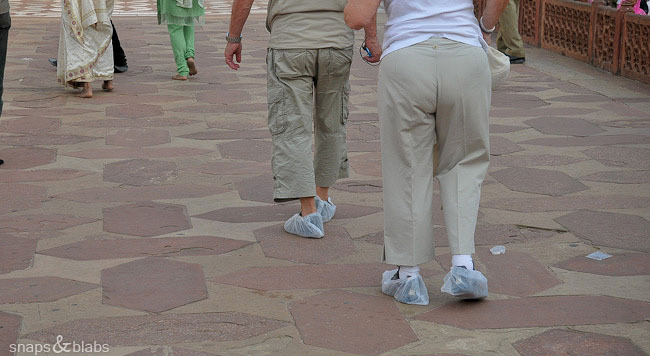 Those booties are hilarious! How can you ever think of wearing them…missing out on the feeling of bare feet on marble. Enjoy your last days in India! Jenny and Emiel, I am so glad you actually read all of this. It started innocently and turned into a novel somehow. Emiel, sadly I think they are badly mismanaging the inside and thus it does not allow for a full appreciation of the space. It will not be hard – professional lighting and better controlled movement of people will go a long way in achieving this. I think there is some talk in making two ticket system, one for the grounds and one for the inside and I think that might also be a good idea. Geri, do not underestimate your talent at travel writing! I think this is indeed one of your best posts concerning actual travel tips (along with the one where you went speed-hiking in the jungle ;-)). 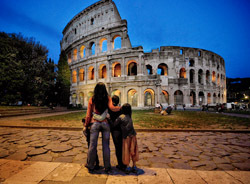 Your pictures do not just show the outside (as seen in the zillions of guidebooks) of the attraction but the interesting tiny details which go unnoticed by most travellers – and above all, they show the feeling you had when visiting this place. All this beautifully complemented by your written thoughts. You know I often miss the “important details” about places in your posts ;-). After reading this post I feel well and truly informed, as if I had been there myself. I could feel the sweating crowds, the shuffling and pushing, the fear of losing my children in the throngs… Excellent! Now off with you and contact a travel magazine! 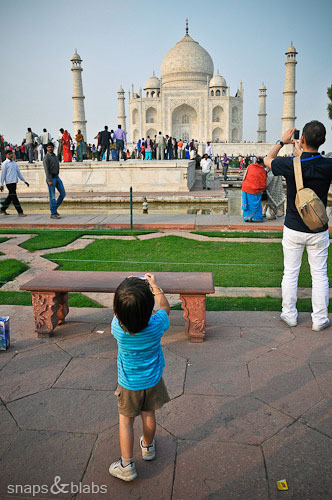 Thanking you for your guiding post…..your writing made me NOT to visit Taj any more which I was planning for my photography documents…….instead I’ll be visiting Vatican of Phedophile Priests….may be I can find out some exclusive stories there to document !! Keep up your writing, good luck and thanking you again!